Author(s): Vivek Asati, Institute of Pharmaceutical Sciences, Guru Ghasidas Vishwavidyalaya (A Central University), Bilaspur- 495009, Chhattisgarh, India. Sanjay K. Bharti, Debarshi K. Mahapatra. The Ras/Raf/MEK/ERK signaling pathway involves various kinases in which each kinase is associated with one another through signals and regulates cell proliferation, differentiation and apoptosis. This pathway is dysregulated almost in all cancers due to the amplification and genetic mutation of various components of the pathway. The genetic mutations have been reported to cause drug resistance to the current chemotherapy of melanomas. B-Raf is one of the most commonly mutated proto-oncogenes and plays a significant role in the development of numerous cancers of high clinical impact. Therefore, mutant B-Raf kinase may be a promising therapeutic target for the development of novel anticancer drugs. Many BRAF inhibitors discovered during the last decade showed promising anticancer activity, especially on tumors that harbor BRAFV600E mutations. Currently, vemurafenib and dabrafenib are USFDA approved drugs used as B-Raf inhibitors. Few drugs which are under clinical development phases such as LGX818, GDC0879, XL281, ARQ736, PLX3603 (RO5212054), and RAF265 etc. pave the path for further designing of B-Raf inhibitors. The present review focuses primarily on the Ras/Raf/MEK/ERK signaling pathway with mutant B-Raf as a therapeutic target for anticancer drug development. The essential pharmacophoric features of B-Raf inhibitors, their structure activity relationships (SARs) and molecules under clinical trials have been highlighted. Keywords: B-Raf, cancer, clinical trials, inhibitors, SARs, signaling pathways. Affiliation:Institute of Pharmaceutical Sciences, Guru Ghasidas Vishwavidyalaya (A Central University), Bilaspur- 495009, Chhattisgarh, India. Keywords:B-Raf, cancer, clinical trials, inhibitors, SARs, signaling pathways. Abstract:The Ras/Raf/MEK/ERK signaling pathway involves various kinases in which each kinase is associated with one another through signals and regulates cell proliferation, differentiation and apoptosis. This pathway is dysregulated almost in all cancers due to the amplification and genetic mutation of various components of the pathway. The genetic mutations have been reported to cause drug resistance to the current chemotherapy of melanomas. B-Raf is one of the most commonly mutated proto-oncogenes and plays a significant role in the development of numerous cancers of high clinical impact. Therefore, mutant B-Raf kinase may be a promising therapeutic target for the development of novel anticancer drugs. Many BRAF inhibitors discovered during the last decade showed promising anticancer activity, especially on tumors that harbor BRAFV600E mutations. Currently, vemurafenib and dabrafenib are USFDA approved drugs used as B-Raf inhibitors. Few drugs which are under clinical development phases such as LGX818, GDC0879, XL281, ARQ736, PLX3603 (RO5212054), and RAF265 etc. pave the path for further designing of B-Raf inhibitors. 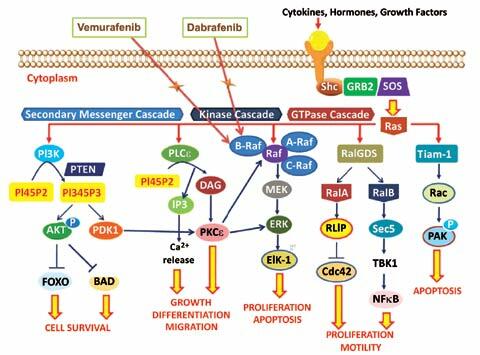 The present review focuses primarily on the Ras/Raf/MEK/ERK signaling pathway with mutant B-Raf as a therapeutic target for anticancer drug development. The essential pharmacophoric features of B-Raf inhibitors, their structure activity relationships (SARs) and molecules under clinical trials have been highlighted.